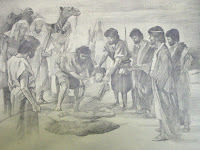 I am Joseph, son of Jacob as I recover from the death of my father and begin to reconcile with my brothers. (Genesis 50). I feel sick in my stomach; I can’t believe dad is dead. After all this time has passed, I never got to spend the quality time I wanted to with him. I can still remember the good memories that I had with him when I was still a child. I loved my father so much, and I miss him more than word can describe. I can still remember a particular gift that he had given me when I was young. He gave me this beautiful coat. It had so many bright beautiful colors on it. It was bright gold, red, and green, with thin black stripes between each color. My name was stitched on the top right of it. That was the best gift dad had ever given me. I can still remember when my brothers stripped me of my coat that dad had given me. They jumped me out of nowhere. At first I thought they were joking with me, but when I looked at Rueben, I could see something was wrong. He wouldn’t look me in my eyes. I could tell something was wrong. Now here we are as a family all back together again. I have so many mixed feelings, so many things to process; so many thoughts are just flying through me head. I wonder if we will ever be able to be a normal family again. Despite all the terrible things that my brothers did to me, I really just want to have my family back. I have had a lot of time to deal with what they did to me. Honestly, it still hurts, I mean they are my own blood and they just did me wrong, as if I was a stranger to them. I know they did not like the dreams I shared with them, but they were from God, it wasn’t my dreams, I never wanted to disrespect them or insult them. Now here we are, and they are all bowing down to me, just as the dream said. What was God thinking? Was this the only way to work out your plan? If you loved me so much God, then why did you take everything from me, why did you allow me to go through all that hardship, all that pain? I was always faithful to you God, why did you turn your back on me when I needed you most? When I was in the pit where, were you then? When I was sold into slavery where, were you then? And when I was in Jail, where were you then? Yet even though I have had to go through so many troubles, I can’t deny God’s hand on my life as well as my families. It is though God had a mission that he was working out through my suffering and hardships. It’s as though my suffering was the birth to life and opportunity for me and my family. Here I am with my brothers eating well, feasting, and living in luxury during one of the worst famines the region has ever seen. It was God who brought me to this point. It was God that spared my family, and reunited me with my brothers. And so it is evident that God’s hand and blessing was upon me even during some of my most terrifying life experiences. I praise God that he has taken me from the lowest depths to the highest heights!!! My brothers approached me today fearfully, and threw themselves down into the dirt before me. They begged and pleaded with me to take them into my house so that they could serve me as my slaves. While I am still hurting and figuring this whole thing out, I really do sincerely forgive them for what they have done. And I really just want to have them back into my life as family, as my brothers. God has worked this thing out, and so how can I hold a grudge against them when God’s mission was being fulfilled through it all. I have come to realize that even though they “intended to harm me” that was only half the story because in that same action there was God who “intended it for good to accomplish what is now being done, the saving of many lives” (Genesis 50:20, TNIV).